A strong and clear radiant blue tourmaline is rare and desired by many, making it a spectacular choice in gemstone for that special piece of jewellery. True blue tourmalines are scarce indeed. Most blue stones contain a hint of green. 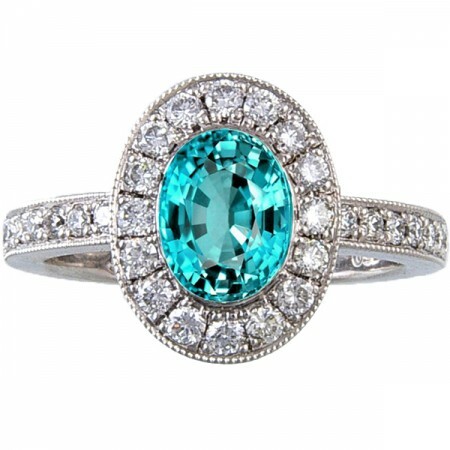 “Paraiba” tourmalines are bright neon blue. They were first discovered in 1989 in the Brazilian state of Paraiba. They are also found in Namibia, Afghanistan, Pakistan and Nigeria. Most valuable of Indicolites show a dark or brilliant blue, similar to aquamarines or sapphires. A purely blue stone will emanate a high degree of brilliance.